Just for fun, as I have been bitten with these new stamps from “Our Crafty Lounge”, from what I have heard they came out with these stamps for the movie “Twilight”. 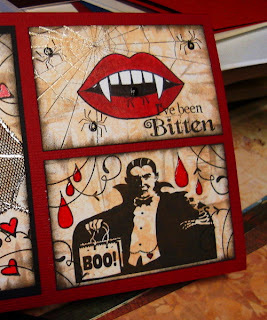 I love the fun fangs, and the drops of blood. 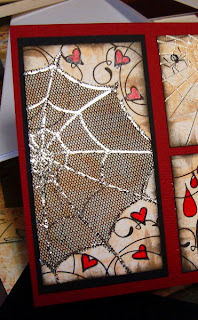 My vampire is a download and the slivery spider web is a netting type fabric. The stamped spider web and spider are from Memory Box, and Red Heart is from Hero Arts. All other stamps are from Our Crafty Lounge. Hope you have a wonderful Halloween, be safe out there. Love it Vada! You can't have to much Halloween! Great colours and images! Brillant use of the fabric! 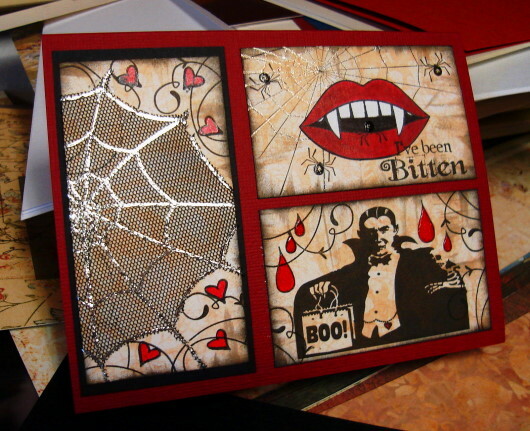 Love this "just for fun" Halloween card! Those are some really cool images and the design is superb! Have a lovely weekend! Spooky and very, very cool. What a great looking card!! Love the colours and the images are perfect! Awesome Halloween card Vada! Love it!